Was asked by the Metropolitan Playhouse to do their East Side Stories monologue series last month. I did it back in 2004 as Dr. Dave Ores. It’s such a great event for the performers, subjects, and the audience. Essentially we are tasked with finding someone who lives and/or works in and around the East Village and to interview them. From there, we convert the recordings into a transcript (very long), which gets edited down to about 20 minutes of stage time. I loved doing this type of performance. I was paired with Larry Schulz, who is the retired Business Manager of the Sandra Cameron Dance Center. He had such a great story. That’s him pictured below after I recorded him in his residence that was formerly the location of the dance studio. His story also included a lot about Sandra, who was a two-time ballroom dance champion. Capturing the essence of his way of speaking and moving was essential for this. Memorizing this was a bit of a bear and I needed to run it a lot because I try to be a precision performer. Larry came to a couple performances. I didn’t know he was at the first one he attended but I was suddenly taken at the end of it and leaked a bit from the eyes. Goes to show how the audience does affect the performance. I wish I could have taped the performance and spliced it with the interviews for posterity. But Actors’ Equity doesn’t allow that. So I’ve included the performance text. If you’d like to use any of it, please reach out to me via the contact page. We bought this place in ’85. We started the studio right where we are, one door north of the Public Theatre. You know, Joe Papp was the one who had the vision for this—this particular area. Nothing was down here. No restaurants. Just, you know, nothing. And, uh, it’s an interesting building. It’s called an A.I.R. building, as most of these lofts are. Are you familiar with that–Artists in Residence? Back in the ’50s, when the printing industry began moving out, it abandoned these big warehouse-type buildings, and artists, uh, inevitably would move into these lofts. But they were living in commercial space, which technically is illegal. And so, the city created the A.I.R. 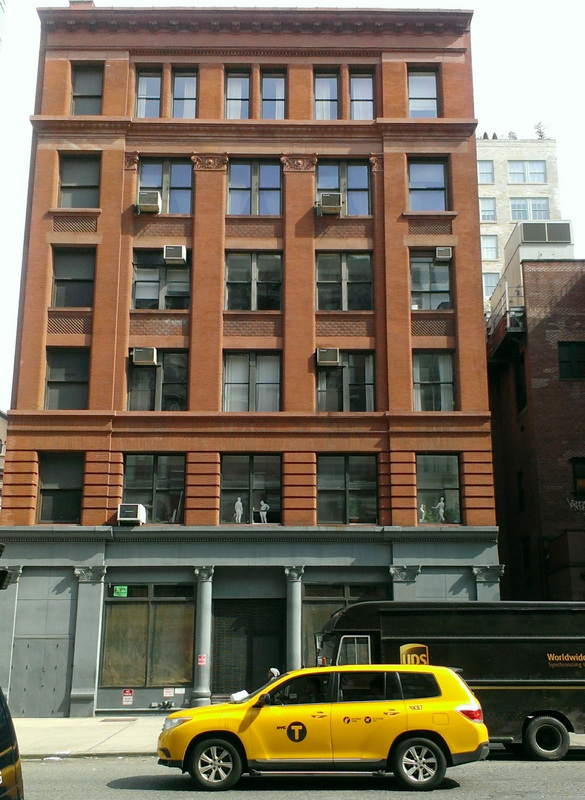 status, which would permit certified artists to live in these commercial buildings. We had essentially three studios here: the large studio, uh, which we could split off into two studios, and then a third studio back there, which is now a separate apartment. 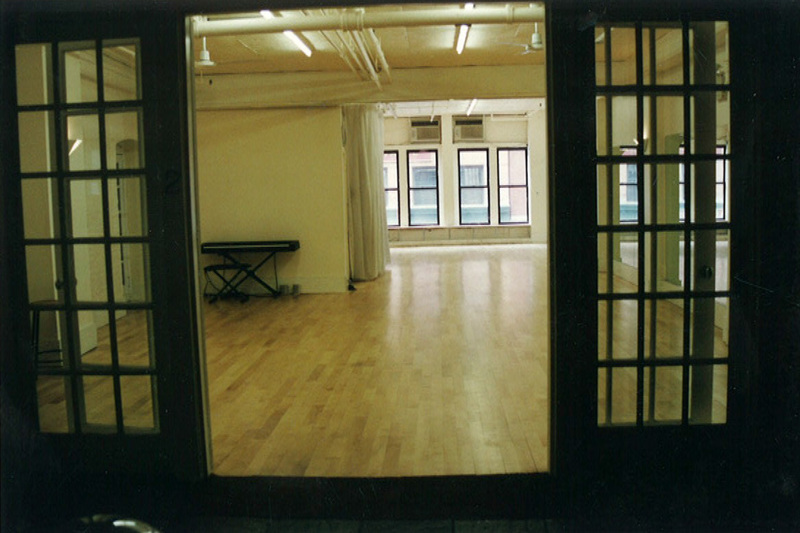 And then, eventually, our business outgrew this space and we moved it down to 199 Lafayette Street and we converted this basically into two apartments. There’s one apartment back there and then there’s our apartment. Hence, we live here. And when I came down here to meet the former owners, we actually sat right here. I think they paid under 100,000 for the space and ended up selling it for 400,000. Now it’s probably worth, you know, millions. 4,000 square feet, so…It’s a valuable piece of property. So I basically retired last July. I have a big, um, project, which I haven’t really gotten off the ground. I have, uh, an enormous amount of videotape from stories that I did when I was in television news for 20 years. And then, I also videotaped all of the performances that we did, uh, here in the business, you know. And I have a lot of video of, uh, Sandra performing. And we have all of these, uh, syllabus tapes where Sandra broke down all these social dances into beginner, intermediate, and advanced levels. So, what I want to do is, uh—this is all on VHS, primarily. So I want to organize it, digitize it, and then donate it to the, uh, Dance Collection at the Public Library. So there’s a record of—of, you know, social dance in the 1970s and ’80s. So, that’s my big project. I mean, it’s not really difficult to transfer. I have the equipment. But it will take me forever, ‘cause I got a lot of stuff. Hmm? Well, I actually grew up here in Manhattan. On the Upper East Side, 95th Street and Madison Avenue, and went to PS 6. And then, when, uh, I entered eighth grade, we moved out to Montclair, New Jersey. And so I went to high school in Montclair. I’m the last generation of—of American kids who were sent off to dancing school. I went to a social dance school all the way through high school. And, I mean, I enjoyed it. But that came to a screeching halt when I went on to Kenyon College in Gambier, Ohio. And then was drafted and served two years in the Army in Baltimore. And, from my two years at Fort Holabird—oh, this is a true story…. So finally they figured out when they saw the “liberal arts,” they thought arts meant “illustrator.” So, they didn’t know what to do with me. But then they needed a librarian for all these secret documents. And so, I ended up essentially being, uh, responsible for all the secret documents that came in and out of this office. I was with them for two years. I tried to get a transfer, but I couldn’t. And, uh, I worked for many years, uh, as a news writer and field producer in Baltimore, where I got interested again and did a lot of stories about dance. You know, there was an article the other day, I don’t know if it was in the Times, but anyway, it was about Edward Villella, the principal dancer for the, uh, New York City Ballet. 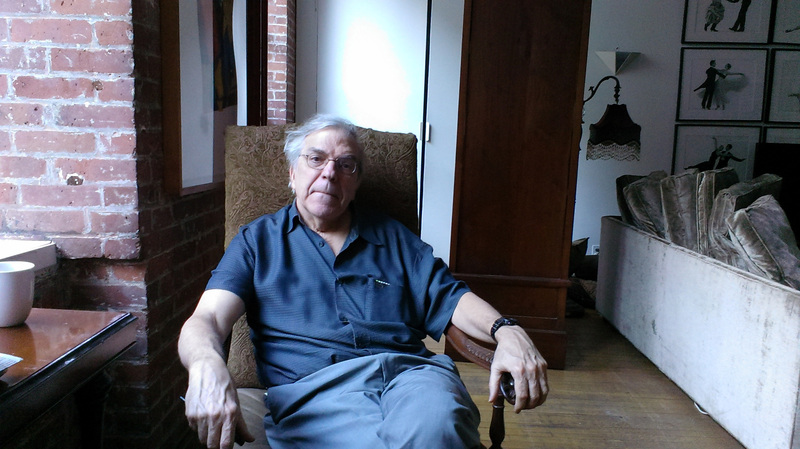 Are you familiar with Eddie Villella? Edward was a principal dancer and he was the, uh, founder and a director of the Miami City Ballet Company. That was around 1978. He must be, like, 80 years old. But I had an encounter with him in Baltimore. He came and was performing with the, uh, Baltimore Symphony Orchestra at the Lyric Theatre. And—and, of course, I had known of him. And I wanted to do a story. And he agreed to the interview, but he was absolutely adamant that we could not film his performance. And, at the performance, I realized why. The Lyric Theatre was a theater for a symphony orchestra. And I couldn’t imagine having a dance performance there. Well, sure enough, he had a performance space of about 15 feet by 15 feet. In front of the orchestra. It was absurd, you know, like, what he was doing? And, uh, I always regretted not smuggling a camera in to shoot this thing. It would have been absolutely hilarious. But I did a lot of stories on dance way back then because I was the only one who had any interest in it in Baltimore. And then, when I came up to New York, to work at NBC…I was the general assignment, uh, producer. But I ended up doing a lot of stories on dance as well. Because in New York, you know, the possibilities were…endless. And again, at NBC, no one was really interested in it. But, you know, I was intrigued by the whole Hustle scene and did stories on all kinds of social dance as well as, you know, theatrical dance. Yeah. And, uh, there was a Fred Astaire Dance Studio up about three or four blocks, uh, up Fifth Avenue from NBC. And so, I saw an ad for a—you know, free introductory Hustle lesson. So, I went up, innocently enough and took the lesson. And throughout the lesson, the woman kept inquiring what I did. And, as a general rule I didn’t tell people that I worked for NBC or that I was in the news business, because, you know, they get all—you know… And so I said, “I’m just here to learn the basic steps of the Hustle.” And this went on for the entire lesson. And so, I pitched the story on Fred Astaire and it turned out that we had done a similar story on Fred Astaire fairly recently. So, they didn’t want to do that story. So, I said, “Okay, I’ll do this story on Sandra.” And so, I called up, and I got in touch with Sandra Cameron. And, uh, I did a profile story on the U.S. ballroom champion. Uh, she had been champion for three years. Three consecutive years. Sandra is a great ballroom dancer. She’s ballet trained but began her ballroom training at the age of ten or eleven in Scotland and, uh, is an extraordinary…I mean, have you ever seen video of Sandra? Okay. I have—I have video. And, in fact, I did a—a—a documentary on Sandra, which—which I can loan you, called Partners, because Sandra and Bill had virtually no footage of themselves. This was…you know, 1978-79, pre-video. And they had virtually no footage. But Sandra was just this exquisite dancer. And, uh, I mean, I didn’t know much about ballroom. I—I knew a lot about dance from my—you know, from seeing dance and doing stories on dance. But I could, you know, see it. This was an exceptional dancer. And then I took classes with her, appropriately, in the Hustle, because that’s what she was teaching. And from there, we started going out. And her business really took off. She came out of the competition dance world, but her focus in the business was on the social dance. And, it really took off, you know, with the whole Hustle explosion, and interest in social dance. And I had just gotten burned out from the news business after 20 years. And so, I went into the business with Sandra. And as long as I stayed in the business end of it, which she had absolutely no interest in, and as long as she stayed, you know, in the artistic end of it, it worked out well. I think, when people, you know, have trouble working together it’s because they end up doing the same thing and fighting over it. We, uh, did not do the same thing. And so, it worked out well. So, we had the studio for over 20 years. And then, actually, we just closed the studio, uh, uh, back in July. We happened to get lucky with the business because of the swing revival. We just happened to be in the right place at the right time. I’m not too sure why it happened. I can’t really think of a cause and effect, or what triggered it. I don’t know if there was a movie or a Broadway show, or what there was. I know the Hustle came back because of a movie called Saturday Night Fever. But yeah, what triggered the swing revival? I should know that. Yeah, let me think on that. I’m sure I can come up with something. I mean—I mean, we didn’t anticipate it. We just happened to be in the right place and we happened to teach it. We taught, among other things, a Savoy-style Lindy hop. So when the swing thing hit, the business really took off. And, uh, so, we were very fortunate. It was just—who would have predicted, you know, that this was going to happen? Um, my introduction to the Savoy was through a man named Al Minns. Al was a great, uh, swing dancer at the Savoy Ballroom in the, uh, 1930s. He was coaxed out of retirement to appear in a show that was put together by a modern dancer named Marleen Pennison. She convinced him to dance with Sugar Sullivan in this modern dance company. And I was working at NBC at the time, and I did a story on Al and Sugar in this dance company. I have a video of the story that I did on them. Pia Lindstrom was the on-air reporter who did the actual interview. But I basically did the story, the research and all. They were performing up at Riverside Church, with Marleen. And my introduction to Al was through a, uh, dance critic and historian who was a friend of mine, Sally Sommer. Sally, I think, is now based down in Florida and teaches at, uh, one of the universities there. But she called me up once and said, “Larry, you know, I’m going to this dance. There’s going to be a great dancer there. You should really see him.” And I’d never heard of him. I really didn’t know much about the Savoy. Um, but she said that he was a Lindy Hopper. And so, we went. And it was a competition event run by a woman named Mama Lou Parks. And so, we went to watch the competition. I wasn’t particularly interested in this. It was very speeded up, with all kind of lifts and throws. But then, in between the competition, there was a, uh, social dance segment. And I looked out and I saw this guy dancing. And you saw this man dance and you saw the music. And I turned to Sally and I said, “Who is that guy out there?” And she said, “Well, that is why you’re here. That’s Al Minns.” And because, well, with someone like Al what you’re dealing with is the origins of the dance. I mean, this was when the dance came right out of the music, and you just saw the music when Al danced. By that I mean… a—a, uh, dancer would understand that. When we learn dance, we often learn steps. And it gets to be a little technical. You know, you have to count and it’s a slow, and it’s a slow, and quick- quick. And, uh, the great dancers get beyond that, and are just totally connected to the music. And, uh, there was just this connection to the music with Al that was just jaw-dropping. So I said, “Can I meet him?” And, so, Sally introduced me. And so Al began teaching this Savoy style Lindy Hop. And I got know him well. But what Al said before and what I didn’t realize, is that the African American culture in Harlem had moved on to other music and other dance forms. And so, there was absolutely no interest in what Al did. And so, when he started teaching, and until he passed away, he taught predominantly to—to, uh, white people, which was okay with him. But in his culture, there was no interest. And, uh, I mean, there was this hilarious moment when he came down and he was working with, uh, Sandra one afternoon. And these three white guys walked into the studio. I’ll never forget this. And they walked in, uh, almost in a line. And they were very formal. And they introduced themselves. And they were from Sweden. And they said they were looking for Al Minns. And so I introduced them. And Al said to me, “Larry, these guys know more about the Savoy Ballroom than I know about the Savoy Ballroom.” Well, I had no idea there was this amazing scene in Sweden and, to this day, they’re very active in the Sweden scene. And so they invited Al to come over and to teach. And, uh, uh—they were three of the whitest guys you’d ever meet. So Al taught for the Center until he got sick and passed away in 1985. And then Sandra convinced Frankie, Frankie Manning, to come out of retirement. Actually, uh, Frankie was working at the Post Office because you know, after World War II the music changed. And there just wasn’t an interest in it anymore. And so, Frankie got a real job with the post office, and, uh, didn’t teach for 25, 30 years. But when Frankie came out of retirement, after Al passed, he became this kind of ambassador and, you know, traveled all over the world teaching it. And taught right up to his, his passing in 2009. And, uh, so, we had this long connection. Frankie was a contemporary of Al’s and was in this very famous group called Whitey’s Lindy Hoppers. They were named after Herbert White, who was the bouncer and, uh, kind of one of the managers at the Savoy. And what Whitey did was he took that and he put it on the stage, and organized it. And he choreo—well, I think they all kind of choreographed material and, uh, traveled all over the world with it. So, you have all these sort of enclaves of Lindy Hop. So Frankie and Al they, uh, both came out of the Savoy and were, uh, contemporaries. They, you know, certainly knew each other and danced together. Well, the count is in the music, but we weren’t quite that sophisticated or advanced to be able to connect to the music in that way. Al struggled with it at first, you know. I mean, the thing about Frankie and Al is their background was not in teaching. It was in performing. So Al would say, “Well, just listen to the music. It’s the bum, bum, ba-dum bum bum.” So, it was a transition. But Al eventually, you know, picked up on it and understood that if this was going to be taught, uh, this is how it was done. I mean, to this day I don’t understand how they did this incredible choreography for White’s Lindy Hoppers without counts. But Frankie was very adaptable. He said, “Okay,” you know, “I’ll count it for you.” He was great. And very generous with it. I mean, that was a thing that always impressed me about Al…and Frankie. There was no racial edge to it. You know, they were just kind of astonished that people were so interested and fascinated by what they did. And they were more than willing to share it. You know, they—they showed absolutely no hesitation about sharing it. And were very gracious, very generous about it. And, uh, we’re all very grateful for that. You know. Just for your information, there’s going to be a big celebration on the Savoy Ballroom on May 26. It’s called World Lindy Hop Day, which also would have been Frankie’s 100th birthday. Uh, it’s going to be like a weeklong celebration and, like, a really major thing. People from all over the world are going to come. Yeah, I’ve been invited to sit on some panel of people who were, you know, there at the beginning of the revival of it. You know, I have a file on that. But you can also go to the website. It’s frankie100.com or something like that. But yeah, there’s going to be a panel. And, uh—and, uh, a couple of the Swedes will be there. I’m not too sure where things are going, you know. I’m a little concerned in the lack of interest in your classic ballroom dances. Some of the studios aren’t even teaching them anymore and if you go to any of the ballroom dances around the city, like up at the 92nd Street Y, which is, I mean, a really older crowd, it’s a little disturbing. I mean, there definitely seems to be an interest in salsa and swing but in the other classic ballroom dances, you know, uh, Peabody and dances like that, with the younger generation, I’m not too sure what’s going to happen. I mean my–my opinion really is not that valid, because I’m not in the scene. What you should really do is talk to the other studios and, uh, talk to the people who are with the New York Swing Dance Society. But what Sandra and I have noticed—and, I mean, this is, um, an impression. Uh, but we have noticed, when we go to other studios for a dance and look at the, uh, listing of classes, there is very little ballroom. Particularly, you know, waltz and foxtrot. And, uh, Sandra was always a big, big believer in at least introducing people to it. I mean, we always had a big ballroom program. It would start out with six dances, which was called the Basic Six, which would include swing and foxtrot, waltz and tango, the rumba and cha cha. But yeah, I think the ballroom is something of an endangered species, you know. And, uh, I don’t know. I think those older dances might pass. You know. I have a regret. I’m not too sure how to um… Sandra and I are big fans of the, uh, New York City Ballet. And Balanchine always had a real interest in ballroom dance. And his favorite dancer—and he had known everyone from Nijinsky on—his favorite dancer was, uh, Fred Astaire. He thought Astaire was the greatest dancer that he had ever seen. And one of my great regrets, is Sandra, back in the ’80s, went through a whole period, four or five years, of recreating and dancing, all this great choreography from the films of Fred Astaire. And, uh, one of my great regrets is that Balanchine never saw Sandra dance the Astaire works. I have video of all this, you know, and eventually I’m going to transfer it because it’s really great stuff. I mean beautiful, beautiful work. Magnificent. But, uh, but, uh, Sandra never had an opportunity to, uh, work with Balanchine. Because, uh, that would have been something very, very, very special. And, uh, that’s about the only regret that I have, you know. That, uh, the—the, uh, timing was just a little off.